No matter how good the human memory this guide is always better. Werner's work is an indispensable tool for those who want to complete their Grand Prix knowledge. What he accomplished over all these years makes it an exceptional publication called the bible. It holds a leading position when it comes to statistics compilation. No matter where I am, it keeps being within easy reach. It doesn't matter which language you understand. What you can find in this book is the collection of numbers, rankings, lap times, years, names, etc. And, history is always the accumulation of those simple facts. In other words, with the FIM MotoGP™ Results Guide, you have a huge and the best database of GP history in your hand. In the press room at GPs we call this book 'The Bible'. It is a wonderful creation, without which my job would be much, much harder. It's a real treasure trove! I am sure it will continue to be the most used book on my bookshelves, just as it has been for the last 20 years or so! That's how essential it is. Werner's &apos;bible&apos; is an indispensable tool to those of us in the media centre. When you hear amazing statistics from journalists and commentators, it's only because we've been able to research them beforehand using his book, and we'd be lost without it. An incredible job. This guide has been and is for me a kind of bible that is always on my side when I have doubts about figures, facts or names. Every journalist following the Grand Prix races keeps this guide on his table in the press room. It gives you the right answer to any question, so... if you are a race fan, you will enjoy it, because it takes you on a long trip, telling the story of the World Championship through the numbers. Werner's essential guide contains all the power of racing's heritage, and puts it at your fingertips. I'm frequently inspired by its contents; I'd often be lost without it. What would we do without it? In the web and digital archive age, Werner Haefliger's small red book remains the absolute reference to be kept in a prominent position on any good sports journalist's bookshelf. What would we be without it? I do not dare asking myself the question. What they think of it! will without doubt be much thumbed by all those who share our passion for motorcycling sport, whether as professionals or as spectators and fans. 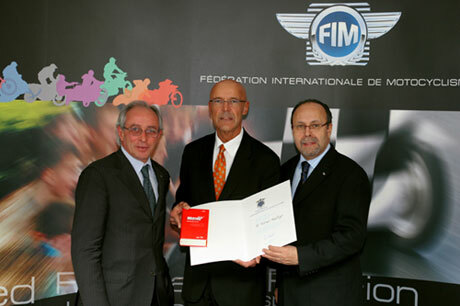 FIM President Vito IPPOLITO (L) and FIM CEO Guy MAITRE (R) present Werner HAEFLIGER with the FIM Motorcycling Merit Diploma at the 2007 Biennial FIM Session in Geneva, Switzerland. has long been the definitive reference point on the history of the oldest World Championship in motorsports, dating back to 1949. 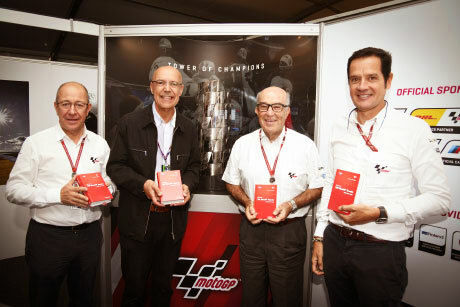 L-R at Assen, The Netherlands/June 2018: Dorna Sports Managing Director Manel ARROYO, Werner HAEFLIGER, Dorna Sports CEO Carmelo EZPELETA and Dorna Sports Managing Director Pau SERRACANTA.